Synopsis: We've got gifts for all! Save Up to 15% today. We're about to do inventory and we'd love to have less to count! Be sure to check out the list of items we're overstocked on and save up to 15%! These deals will be gone as soon as we get our stock levels down to a reasonable level. I've just added about 125 new products to the site in the last few weeks. 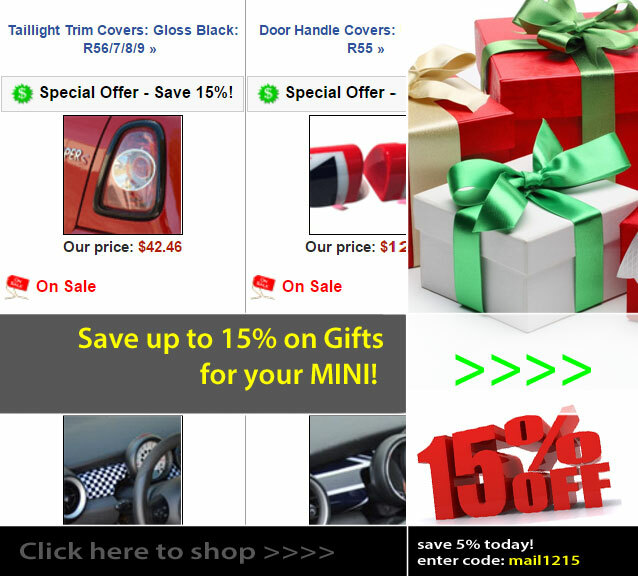 Every week I'll even more OEM MINI Genuine Replacement Parts to our online catalog. Now you can get all of your repair and replacement parts at OutMotoring.com! Copyright © 2015 OutMotoring, All rights reserved.